The Glissando seems like a relatively simple piano ‘manoeuvre’. We know it represents the quickest way ‘to glide from one pitch to another’ (according to Wikipedia) and it’s often presented as suggested in the image above. Essentially the fingers ‘slide’ over the keys in order to produce a very swift and even sound, providing plenty of drama and élan. Glissandi appear reasonably infrequently in piano music, although are much more common in Twentieth Century and Contemporary music. Some see them as ‘cheap tricks’, an added ‘extra’ to thrill an audience, but many composers such as Ravel, Bartók and Prokofiev, have used them to powerful effect. The question is this; how do we play them without injury? Unfortunately, they are often the cause of a blood stained finger, ripped, or even worse, shredded skin. Sweeping fingers across keys from one end of the keyboard to another can be hazardous, especially when experimenting with various fingers and finger combinations. Most pianists will agree that whilst there might be several ways to play the glissando, few guarantee total safety for the pianist. Plasters and antiseptic at the ready….! Decide where the glissando must start and finish; locate all the notes and keep the distance firmly in mind. 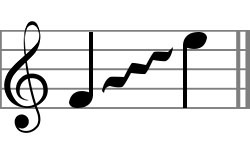 If going from bottom to a top note (in the right hand), use the back of the hand (i.e. the top of the hand) and hold fingers close together, to form a firm position. Start the glissando using mainly the middle finger (third finger), the others (index and fourth finger) may join later, as the hand heads up the keyboard. Crucially, only use your finger nails to play the notes or keys (if the skin is used, it will usually tear), and lightly swipe the keyboard, with just enough strength or power to sound every note evenly, but without any jerky, bumpy notes. The left hand can also use this technique when playing downward glissandi. For glissandi heading down the keyboard in the right hand (and up in the left), try using the thumb on its own on the starting note, and drag it downwards across the keys quite lightly but firmly, again, enough to sound every note but not to get ‘stuck’ and cause unevenness. Again, it’s best to use the finger nail, making sure all notes sound properly, and are even and clear. Using finger nails encourages fingers to slide easily from one key to the next, and hopefully stops any injury. Black key glissandi need even more care, but again, employing finger nails can also be effective, if used judiciously. Practice fairly slowly at first until you have got the hang of the necessary ‘swiping’ movement. Aim to ensure fingers are at a forty-five degree angle too. Useful post, Mel! I’ll never forget the trail of blood I left across the keyboard when I was a student after the first rehearsal with orchestra of Dohnanyi’s Variations on a Nursery Song. There’s a long glissando at the end and I got a bit carried away with enthusiasm. My advice to students is to mime glissandos 99% of the time during practice, since you don’t really have to practise them much at all.